Presiding over the grand Plaza de Mayo, the Catedral Metropolitana (Metropolitan Cathedral) is the seat of the Roman Catholic Church in Argentina. This 19th-century neoclassical cathedral is the church where Archbishop Jorge Bergoglio—now Pope Francis—performed mass before he was elevated to the Vatican in 2013. Most Buenos Aires sightseeing tours stop at Plaza de Mayo, where the Metropolitan Cathedral and Casa Rosada are the main attractions. Visitors can explore inside the cathedral on a guided tour, including the mausoleum of San Martín, Tomb of the Unknown Soldier, San Martin de Tours chapel, the crypt, and Pope Francis Museum. Another popular choice is to take a Pope Francis tour of Buenos Aires, visiting sights associated with the pope. There is no admission fee to visit the cathedral. Mass is held several times daily and free concerts are held regularly. The main areas of the cathedral are wheelchair accessible. The cathedral is located on the northwest corner of Plaza de Mayo, in the heart of central Buenos Aires. The closest metro (subte) stations are Catedral (Line D) and Plaza de Mayo (Line A). The cathedral is open daily and holds mass several times a day. An early morning visit offers the best chance of avoiding the crowds, while the most atmospheric time to visit is for Christmas Mass (Noche Buena), held at 10pm on December 24. The cultural and political heart of Buenos Aires, Plaza de Mayo is ringed with monumental buildings, such as the pink-painted government palace called Casa Rosada, where Eva Peron (Evita) stood on the balcony and addressed the nation. 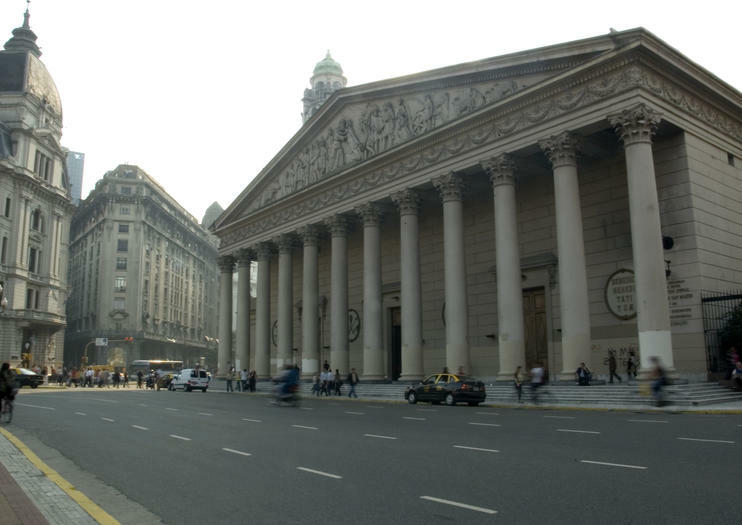 Along with the Metropolitan Cathedral, other buildings of note include the imposing Banco de la Nación (National Bank) and the Cabildo (Old City Hall), as well as a large central plaza with the Pirámide de Mayo obelisk. Journey from colonial times to present-day with this 3-hour walking tour of historic Buenos Aires – an ideal introduction to the capital for first-time visitors. Stand before the grand Metropolitan Cathedral on Plaza de Mayo; see the Casa Rosada, where Evita famously addressed the people from the balcony; and stroll along Calle Florida, where the historic buildings have been transformed into designer boutiques. There’s also time to explore the lively San Telmo market and see the modern riverfront district of Puerto Madero. Buenos Aires is a sprawling city that can be intimidating to explore on your own, so get a stress-free introduction to Argentina’s capital with this small-group tour. Cruise through distinctive neighborhoods like Palermo, Recoleta, and Retiro in an air-conditioned minivan while a guide shows you the top sights. Stop to explore at highlights like Plaza de Mayo and the Boca Juniors Stadium, and enjoy convenient pickup right at the door of your hotel. The tour will take us through the past and present of Buenos Aires starting with the north of the city, passing through the neighborhoods of Retiro, Palermo and Recoleta. Big parks a squares, beautiful French-style mansions, reflecting the glory years of the Portenian society of the early twentieth century with its museums, monuments and natural ravines. Combine two best-selling tours and save up to 33% off the regular prices with this great-value Super Saver. First, enjoy a comprehensive city tour of Buenos Aires, visiting sights such as La Boca, Palermo, Plaza de Mayo, and passing by the Recoleta Cemetery. In the evening, attend a spectacular tango show at Café de los Angelitos or Catulo, including a delicious 3-course dinner at the venue. Experience the history and heritage of the world’s third largest Jewish community on this private 4-hour tour of Buenos Aires’ Jewish sites. Explore the Jewish quarter of Once and visit the magnificent Great Temple Paso synagogue, the AMIA building and Lavalle Square. Learn more about the city’s Sephardic and Ashkenazi cultures at the Jewish Museum; tour the Libertad Synagogue, Buenos Aires’ first synagogue, and view the poignant Holocaust memorial at the Metropolitan Cathedral. This private shore excursion offers a great-value introduction to Buenos Aires and is designed for cruise passengers traveling in groups of more than 10. Your full-day city tour can be customized to suit your preferences, visiting neighborhoods such as La Boca, San Telmo, Puerto Madero, and Palermo, and stopping to see landmarks including Recoleta Cemetery, Caminito Street, Casa Rosada, and the Obelisk. With just one day in Buenos Aires, there’s a lot to see and do, and a private tour ensures you maximise your time. On this private 4-hour sightseeing tour, admire landmarks such as the Metropolitan Cathedral, Plaza de Mayo, and the Obelisk; visit Evita’s grave at Recoleta Cemetery; and explore neighborhoods such as La Boca, San Telmo, and Puerto Madero. Hotel pickup and drop-off is included. Tick off 2 top sightseeing experiences in just 1 day on a city tour and sailing boat cruise in Buenos Aires. Begin your day exploring the capital’s historic and vibrant neighborhoods, benefiting from insights provided by your guide, then transfer to sailing boat for a relaxing cruise along the coastal channel, with a 3-course lunch served on board. Let your imagination transport you back to the 1930s and lose yourself in a mesmerising tango show at the Esquina Carlos Gardel, named after the legendary tango singer who once frequented the venue. The glamorous costumes, world-class dancers and live orchestra are sure to impress, while you enjoy an a-la-carte dinner and unlimited drinks. Upgrade to include a private city tour and combine your night out with a day of sightseeing, visiting the La Boca neighborhood, the Recoleta cemetery, the San Telmo tango district and the grand Plaza de Mayo. Short on time? This private 3-hour tour guides you through the vibrant neighborhoods of Buenos Aires and allows you cherry-pick the sights that most interest you. Visit landmarks like the Obelisco, Plaza de Mayo, the Cabildo and the Metropolitan Cathedral, then stroll around the colorful houses of La Boca or admire the redeveloped waterfront of Puerto Madero. Pay a visit to historic San Telmo, check out the monuments on San Martin Square or explore the elegant mansions, museums and parks of Palermo. Combine a Buenos Aires city tour with an unforgettable dinner tango show. Accompanied by a local guide, explore neighborhoods such as La Boca, Palermo, and Puerto Madero; and visit sights including Plaza de Mayo, Recoleta Cemetery, Caminito Street, and the Palermo Woods. In the evening, attend a spectacular tango show at La Ventana, including a delicious 3-course dinner at the venue. Avoid the hassle of advanced planning on a private city tour of Argentina’s vibrant capital. Follow a comprehensive itinerary, flexible to suit your requests, and discover landmarks including La Boca and Plaza de Mayo, with insights provided by your professional guide. Avoid the hassle of finding a meeting point with included hotel pickup and drop-off, and travel between dispersed highlights with ease via private vehicle. A guided tour is a fun and interactive way to learn about the history of Buenos Aires. This guided tour takes you through city parks, past French-style mansions, and national monuments as you pass through the neighborhoods of Palermo, Retiro, and Recoleta. As you travel by foot and private vehicle, your guide provides insight you might miss on your own. Combine a walking tour of Buenos Aires with visits to the Museum of Latin American Art of Buenos Aires and the Colón Theater during this morning excursion. Immerse yourself in the street life in Puerto Madero and San Telmo, then choose to visit one or both cultural institutions (select option at checkout).